Nov. 16, 2017 11:44 a.m.
Have you ever wanted to experience the Armed Forces without actually having to sign up? 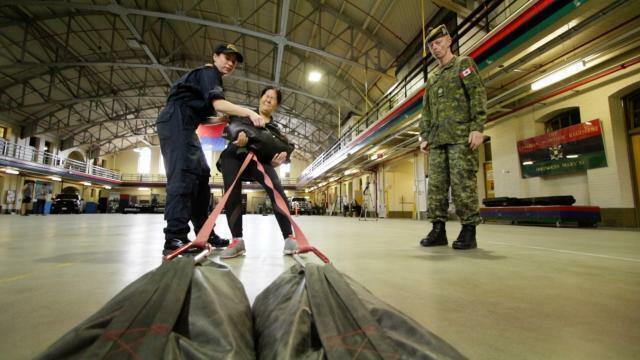 That’s how Goldstream Gazette reporter Kendra Wong felt when she learned of the chance to participate in a special hands-on, fully interactive practice run of Victoria’s “Experience the Canadian Armed Forces” at the Bay St Armoury in Victoria. Donning her runners and workout gear, the diminutive reporter who stands roughly five feet tall but has the internal fortitude of a large linebacker on your favourite football team, demonstrated her athletic abilities and resiliency on Thursday. This dry-run was organized in preparation for a full event on Saturday at the Armoury, which will be open to the public from 10 a.m. to 3 p.m.
Officials chose this interactive experience to provide the public with an inside look at what it’s like to begin a career as a soldier, sailor or aviator. Members of the media were given the opportunity to take part in dry land training, attempt the Forces’ physical fitness test, sample military rations, try on full combat gear, and practice on a fully electronic shooting range. When approached with the opportunity to put on her camouflage and test her limits, Wong jumped at a chance that doesn’t come around all the time. “It sounded like a an extremely interesting opportunity,” she added.